The N.J. Department of Environmental Protection required holders of the Basic Industrial Stormwater General Permit to eliminate the discharge of boat bottom washing wastewater by March 1, 2010. Marinas have the option of capturing the wastewater and recycling it, hauling it away for proper disposal, request permission to connect to the sanitary sewer where applicable, or ceasing the practice of washing vessels. Recent advances in bottom paint technology will also help marina operators manage their vessel wash wastewater. The Agent will continue to follow advances in bottom paint and provide this information to the recreational boating industry as it becomes available. NJSGC’s marine recreation agent has gathered the following information on vessel wash wastewater systems, wastewater analysis and other pertinent information is available below. In addition, the Agent will continue to provide technical assistance to marinas to help them develop and construct vessel wash wastewater systems. Contact Mike Danko at 732.872.1300 ext. 29 or mdanko@NJSeaGrant.org for more information. Marinas conducting vessel maintenance activities such as mechanical repairs, refurbishing, painting, fueling and cleaning operations are required to have a Basic Industrial Stormwater General Permit. 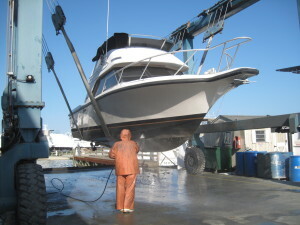 By March 1, 2010 marinas must eliminate the discharge of vessel wash water into surface and ground water. NJ Department of Environmental Protection developed the Basic Industrial Stormwater General Permit and Guidance for Marinas, Stormwater Pollution Prevention Plan Forms, and a Boat Rinsing Policy. A permit-by-rule for the construction and/or installation of boat wash wastewater systems and associated infrastructure was developed to provide regulatory assistance for marinas implementing measures to cease the discharge of vessel wash wastewater. Wastewater generated from washing vessel bottoms may contain various levels of both solid and dissolved metals (copper, zinc, lead, iron and other metals), organic materials (barnacles, tube worms and algae) and salts. The amount of lead in the wastewater can be greatly reduced by removing the sacrificial anodes prior to pressure washing and by using hull cleaners sparingly. Studies indicate the metals commonly found in vessel wash wastewater bind preferentially to fine particles. These fine particles and bound metals can be difficult to remove from the wastewater through filtration. In addition, when the wastewater is recycled and particles remain, this residue can lead to the early breakdown of the pressure washer. Installing a system that is designed to meet the needs of your facility is critical to keep installation and maintenance costs to a minimum. Things to consider include number of boats washed per, size of boats, types of bottom paints, washing season (all year, fall/winter months, freezing temps), rainfall diversion, cost of maintenance, monitoring requirements , storage shed, and size of the collection pad. We have created a list of information about your facility that you will want to complete before taking a look at the systems available or meeting with a consultant. An average of blank gallons can be expected to be recovered, but can vary widely depending on weather conditions, length of boat, growth on hull and other factors. Components – pad, collection basin with at least two compartments of sufficient size to allow solids to settle, treatment system or storage tank. Washington State developed a guidebook to help marina operators select wastewater treatment systems and disposal options, and is available on our website. With funding from an I BOAT NJ grant the NJSGC Marine Recreation agent was able to prepare case studies of marinas with a variety of vessel wash wastewater systems to provide guidance and technical advice to marina operators. In addition, I BOAT NJ grant program funded wash wastewater studies at All Seasons Marina and Dillon’s Creek Marina. Detailed information on these projects is also available. Evaporation has been identified as a possible method to dispose of wastewater and depending on your location may provide a cost effective means of disposing the water. An example of a solar evaporator can be found by clicking here. There are a number of companies that manufacturer wash wastewater treatment systems and collection pads. We have provided a list of companies and encourage you to visit their websites and investigate the many options to find a system that meet the needs of your facility. The list of companies can be downloaded by clicking here. As a result of funding from I BOAT NJ and the National Fish and Wildlife Foundation, the NJSGC developed the Marina Industry Enhancement (MIE) Program. The MIE Grant Program providing technical assistance for vessel wash wastewater systems and funding for best management practices (BMPs). The Program provided approximately $500,000 to help marinas implement various BMPs that helped them comply with regulations and achieve Clean Marina status. Grant applications are currently not being accepted. To receive updates on the grant program and information BMPs that you can implement at your marina please sign up for the NJ Clean Marina Newsletter by clicking here. Additional information on the NJ Clean Marina Program, recycling shrink wrap, presentations from workshops, emergency response and inspection templates, and other relevant topics. If you have questions or need more information please contact Michael Danko at 732-872-1300 ext. 29 or mdanko@njseagrant.org.